T he National Hemi Owners was birthed in 1975 by a couple of college students at Michigan State… Popular Hot Rodding carried a letter and 12 responded. But they then went to work finding others and pretty soon Hemi Hunting was a household word in the NHOA… Thousands of cars were found and thousands more were resurrected. In 1978 Mopar Muscle was spun off as non-Hemi owners wanted the same benefits as the Hemi owners but there was a faction of Hemi owners that demanded purity-you had to own a Hemi??? Direct Connection parts below dealer cost, national and local get togethers, information –packed newsletters and parts exchange was the order of business and it flourished to the max. Mopar Muscle took off in its direction led by gifted and passionate appointed prez Christina Grinius with local clubs springing up nationwide and as many shows. 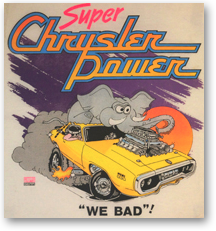 Northeast Hemi Owners took off on a regional basis doing very well and Hemi Owners Parts Division spun up into Chrysler Performance Parts Assn (CPPA). In a very fascinating coup de etat, the NHOA board changed the NHOA articles of incorporation and ousted Roland. They quickly dwindled to near oblivion within a year while Roland went on to start Chrysler Power Magazine-the first and foremost Mopar enthusiast publication. A consortium of Chrysler engines specialists and credentialed engineers (Gary Pavlovich, Gary Stauffer, Roland Osborne & Martin Ahlgrim), met with foundries and patternmakers in California to begin production of a series of Gen II Poly manifolds which will work well from idle to 6500rpm in “as cast” form for all 277-301-303-313-318-326 Plymouth and Dodge Poly engines as well as BUILT Stroker Polys. Using the dual plane air-gap technology of the modern Hot Heads HEMI intake manifold, graciously loaned by Bob Walker of “Hot Heads” in Lowgap, NC, and using Hot Heads’ original patternmaker and foundry, Javier Vasquez/FoundryWorks, POLY SUPER-PAC now has this ‘hot-ticket’ available to bolt on and go spank some unsuspecting Chevys, Ford and Hemis. 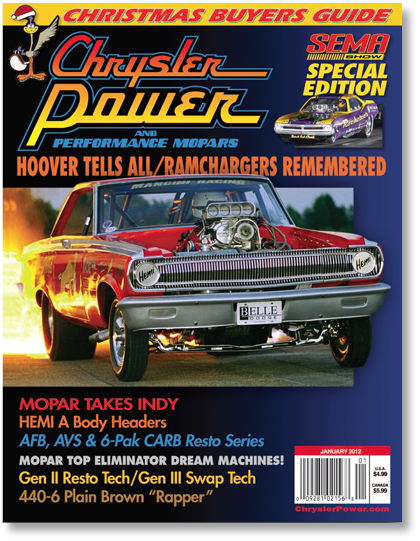 When Chrysler Power started there were no Mopar enthusiast magazines… In the height there were six magazines-more than all Petersen or Dobbs. Both Dobbs and Harris (Mopar Action) approached Roland to do theirmagazines... Great editors like Geoff Stunkard, Dave Freiberger and SteveMagneto Magnante and many others did their first stories with Chyrsler Power…The BFG HemiCuda poster car came thru Chrysler Power…The untimely death of Roland’s wife Jane caused publishing to be suspended in November 1998. It’s a new day!!! Roland had been drafted by Racers For Christ in 1993 to develop chapel services at all the Mopar shows; Maple Grove, Englishtown, Bristol, Carlisle and Indy. In 1995 Christian Motorsports Illustrated magazine was launched. 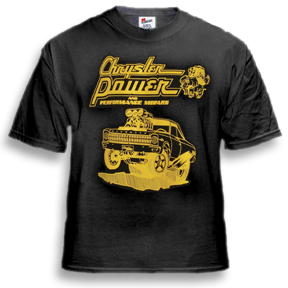 Then as chaplain for the Monster Mopar 2008 show, Roland decided to make up a batch of the old NHOA shirts and see if there was any interest… There was and the encouragement mounted to the place where it was decided to do a series of Chrysler Power “one shot” magazines… the first issue being invited to be in the magazine racks at the 2011 Las Vegas SEMA Show. Sign up! Sign your friends up… buy the t-shirts, mags, trinkets and kool-aid… We are expanding our national distribution outlets and have made the bulk pricing available to you. Get your bulk copies now for $2 each for the minimum purchase of just 10 copies.